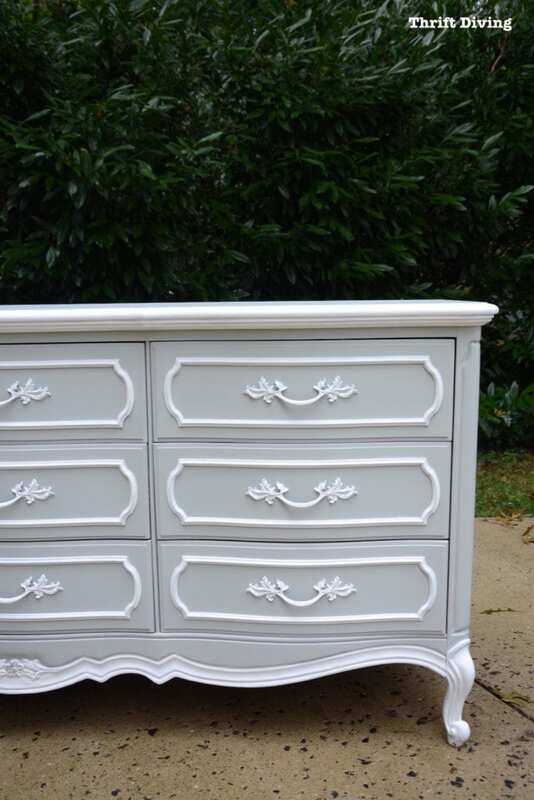 DIY Dresser Makeover: The $40 Thrifted French Provincial Dresser! 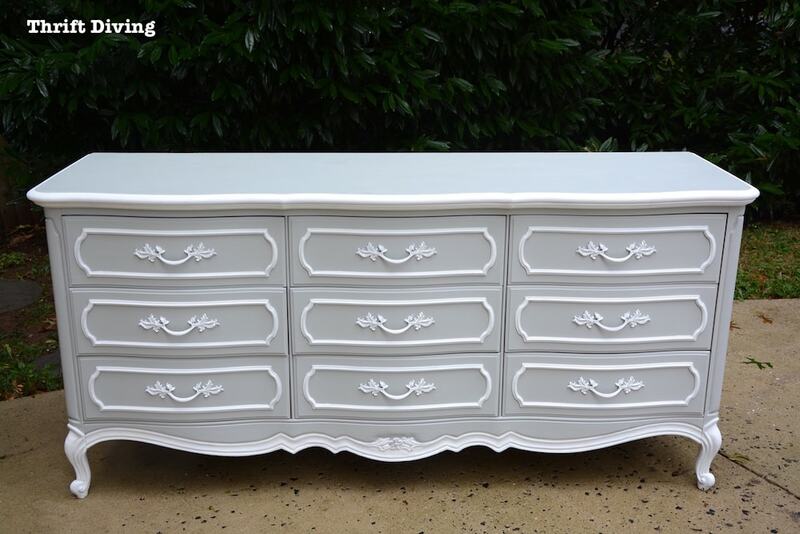 I think I’ve just set a new record: fastest DIY dresser makeover ever on this cute little French Provincial dresser!! If you’ve been reading this blog for any length of time you’ll know that I’m infamous for lugging furniture and thrift store goodies home and hoarding letting it pile up in my garage for years. 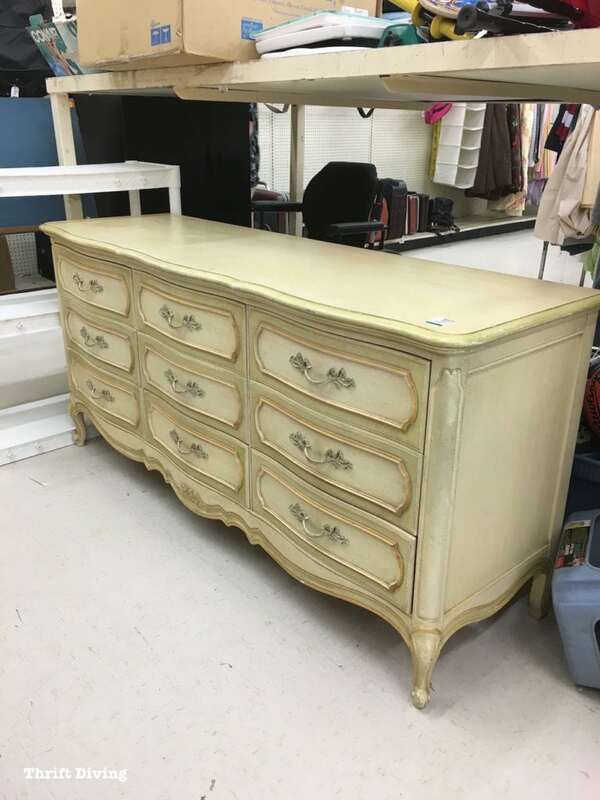 It’s unheard of that I found this French Provincial dresser at the thrift store for a mere $40 and turned around and gave that baby a makeover so quickly! There are several reasons for this, but the most important reason, folks, is that my garage is prime real estate now. I’m down to narrow walkways that require the sucking in of one’s gut to get through. As cute as this piece of furniture is, it just ain’t gotta home in my garage for longer than a week it needs to go. But it also happens to be that my mother-in-law is in dire need of a dresser. I love when the stars align like that…. Here’s what it looked like when I stumbled upon it last week at the thrift store: solid, “clean,” with minor imperfections…. With a little bit of paint, it’s soooooo cute and almost ready for my mother-in-law’s house after I get back from my blogging conference!! (And can you believe that hubby actually said it looks nice?? He’s a tough one to get compliments from. Maybe because he knows it’s going to his mama…..LOL). 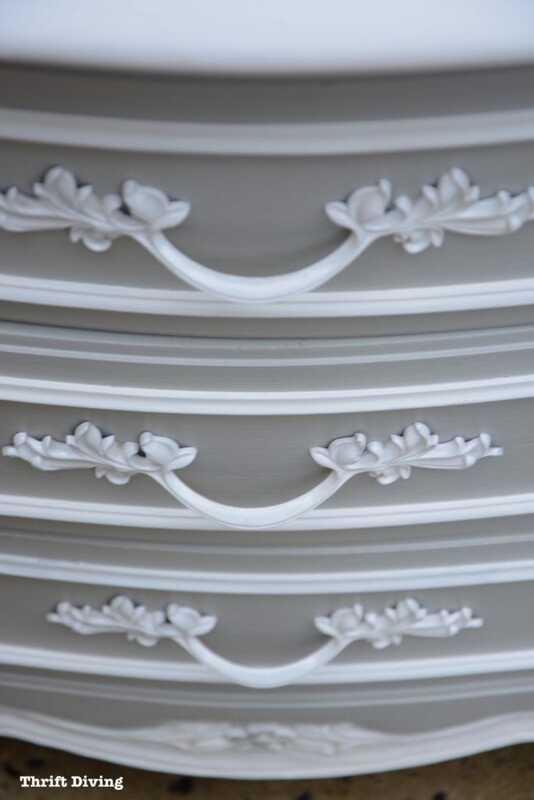 The subtle shade of Soft Gray and white make me wish that this was going into MY room! But I don’t have space for it, unfortunately. And how two-faced would that be to steal furniture from under the nose of family members? I already promised it to my MIL. Let’s Start With the Paint! 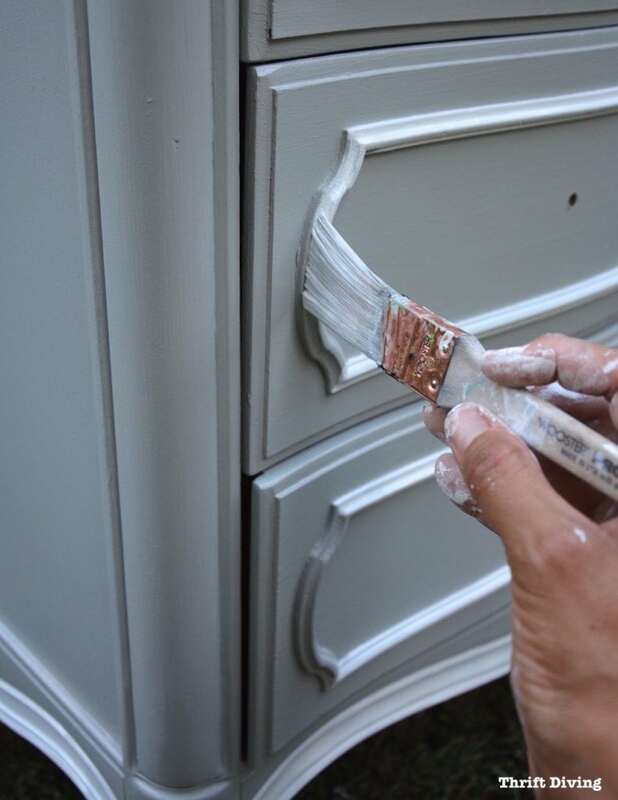 A lot of time, people are afraid to get started with painting furniture because they think it’s some Secret Society of Furniture Painters and they don’t know the password to get in. But the truth is that if you’ve used a roller before (you’ve painted a room before, right?? 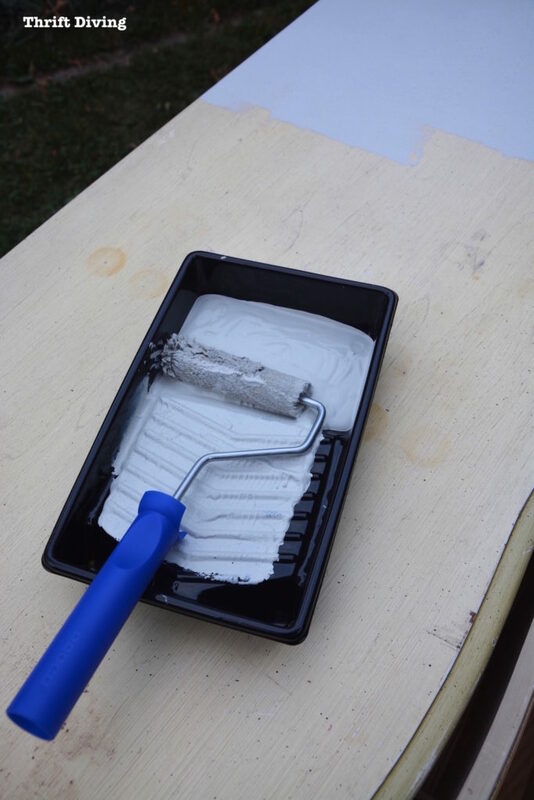 ), then you can paint a piece of furniture with non-toxic Beyond Paint. Beyond Paint recommends using a roller for best results and for reduced brush strokes. 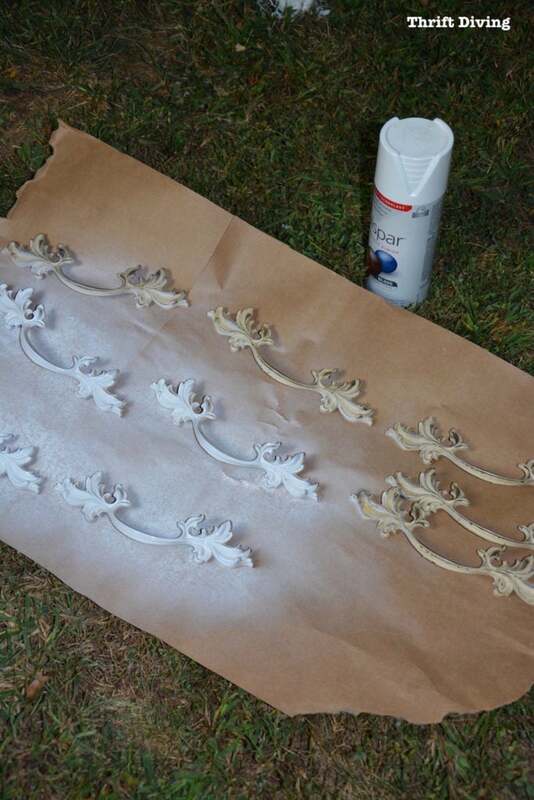 So you don’t have to feel like a putz because you don’t know how to do fancy, confusing furniture painting techniques! None of that is needed here. And you can paint virtually any surface: wood, laminate, plastic, glass, masonry–the list is long! 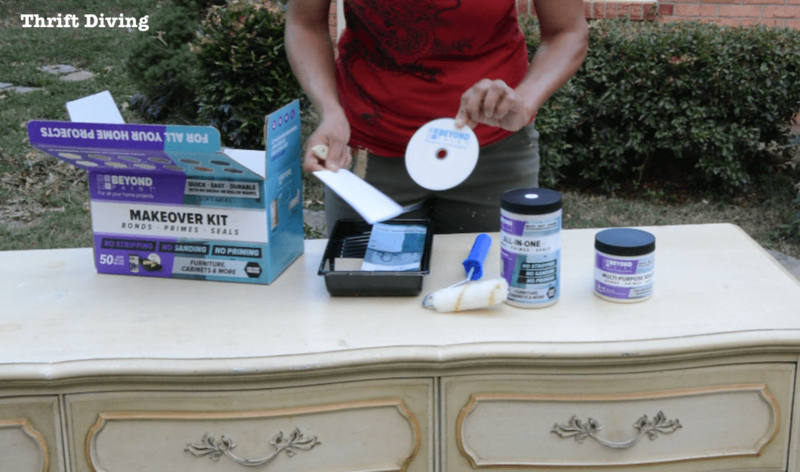 They had sent me this Makeover Kit, which was awesome, because it had everything in it that I needed, including 1 quart of Soft Gray paint, a roller handle and two rollers, a paint brush, paint tray, and sandpaper! I didn’t have to go and buy anything else or dig around trying to find rollers and sandpaper. But check this out–it even had an instructional DVD included! How cool is that?? These are the magic words when it comes to furniture makeovers, but it’s not always true. 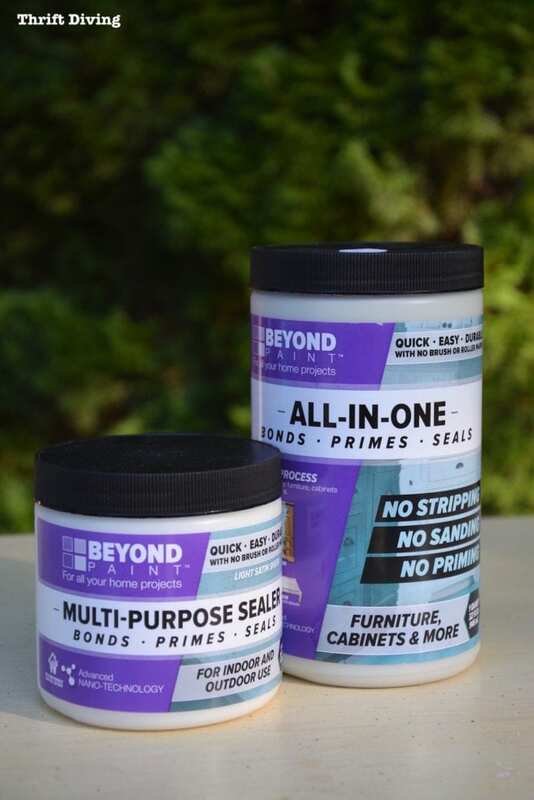 Yes, you can use Beyond Paint on virtually any surface (wood, previously painted objects, plastic, laminate, cabinets, masonry, etc.). 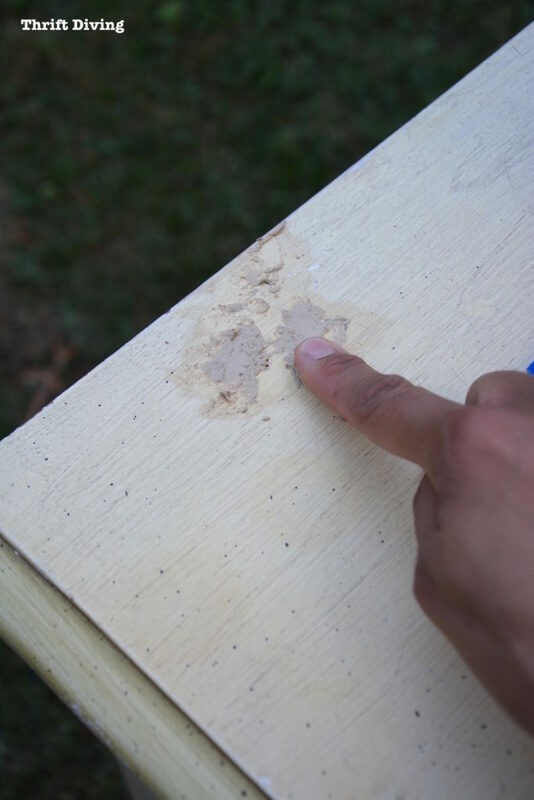 Depending on the condition of your furniture piece, though, you might just have to do at least a small repair before you jump right in. This French Provincial dresser is a great example. It was in excellent condition but had a gouge on top. You don’t want to paint over that, no matter what brand of paint you’re using. It would look horrible painting over gouges!! I used wood filler to fill it the gouge, let it dry, then sanded it smooth with the sandpaper that came with the makeover kit. Once sanded, the top was ready for paint! One thing I like about Beyond Paint is that it’s thick. I’m talking “thick-like-custard” thick. But in a good way, because I feel like it goes on more smoothly than other paints I’ve used, so I’m able to spread it more easily and get done faster! You can’t even see the uneven gouge now, can you? (Nope, that’s not Photoshopped!). That is the reason I need to get my garage in order, guys! Not to mention the embarrassment of crawling around on your hands and knees with a paint brush in hand! I started this project late in the afternoon, right before sundown. I hoped to get it done before daylight was gone (doggone change of season). But unfortunately, those moldings on the drawer required more time and effort than painting the body. I had to pick up where I left off the next afternoon. For a good 24+ hours our lawn resembled the Beverly Hillbillies or Fred Sanford with this big ‘ole piece of furniture sitting there overnight! Remember I painted my kitchen and told you about that Sensitive Surfaces tape? Well, it came in handy for this project! I didn’t want regular painter’s tape to pull off fresh paint, so this helped to keep the finish looking good. But taping around the curved parts was nearly impossible, so I just used an angled brush to paint the top of the curves and didn’t get all “Miss Perfection” about it! 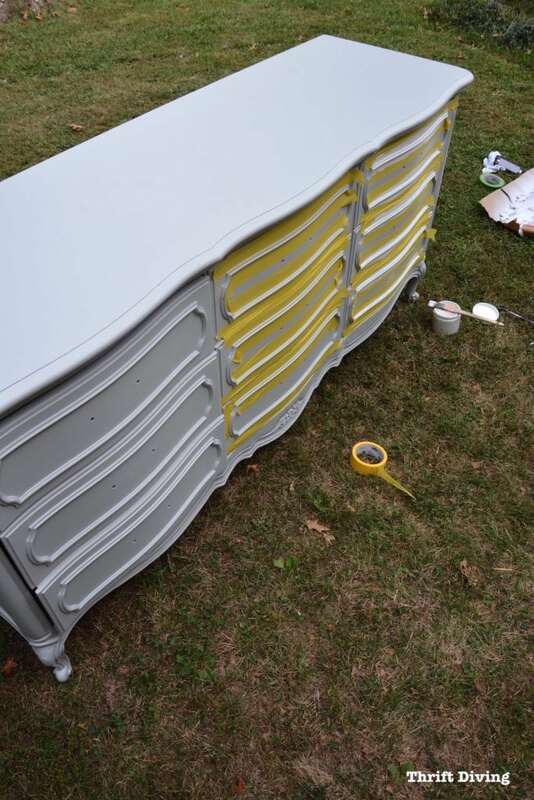 Thankfully, I had some spray paint on hand to update the dresser pulls. I loved the crisp white! Yep, I’ll definitely be sealing the top of this dresser! Dressers get a lot of “traffic,” which means you’ll always be setting lots of things on them, touching them, etc. So I’ll use the Beyond Paint sealer on the top (2 coats), to make sure the surface is extra protected for my mother-in-law. You apply it with a roller, too. 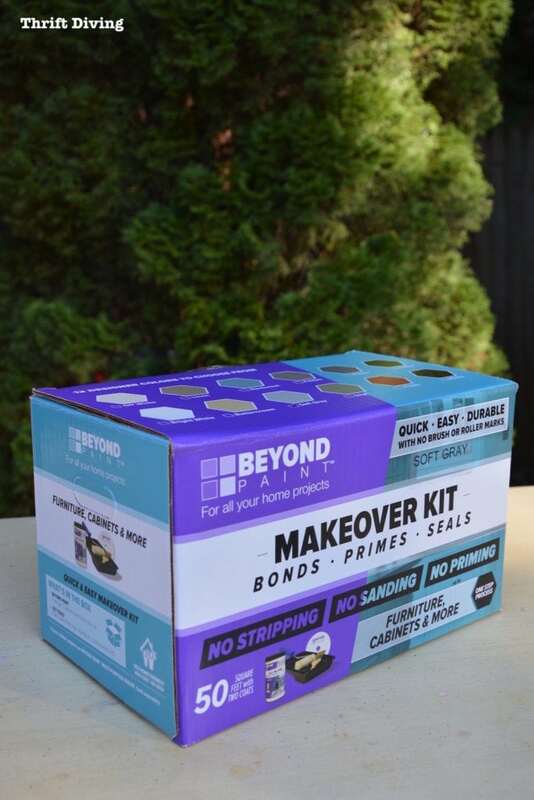 But Beyond Paint is seal-sealing, so if something doesn’t get a ton of “traffic,” feel free to skip the sealer. 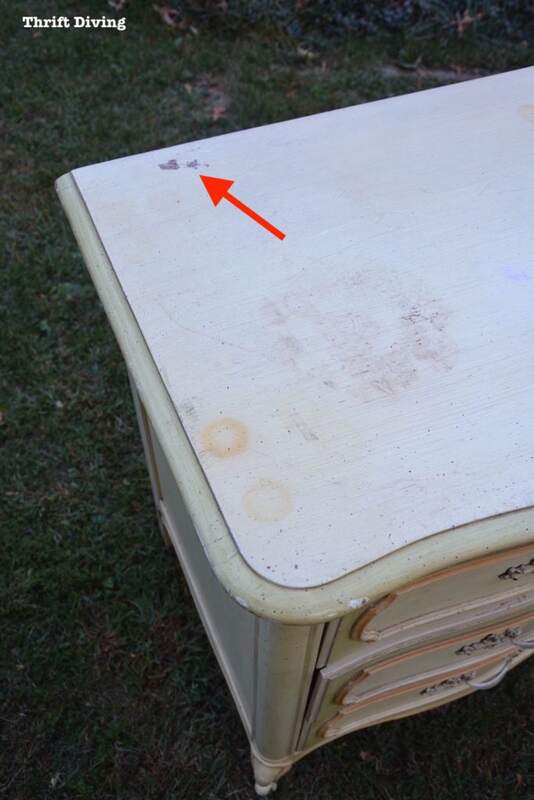 I hate waxing furniture, so anytime I can skip it–woo hoo! I’m just thankful that I took the initiative to get the dresser done quickly and that she’ll have something pretty in her room! She won’t have to remind me a year from now to complete it. HA! Anyhow, it feels good knowing that my DIY skills went to good use! 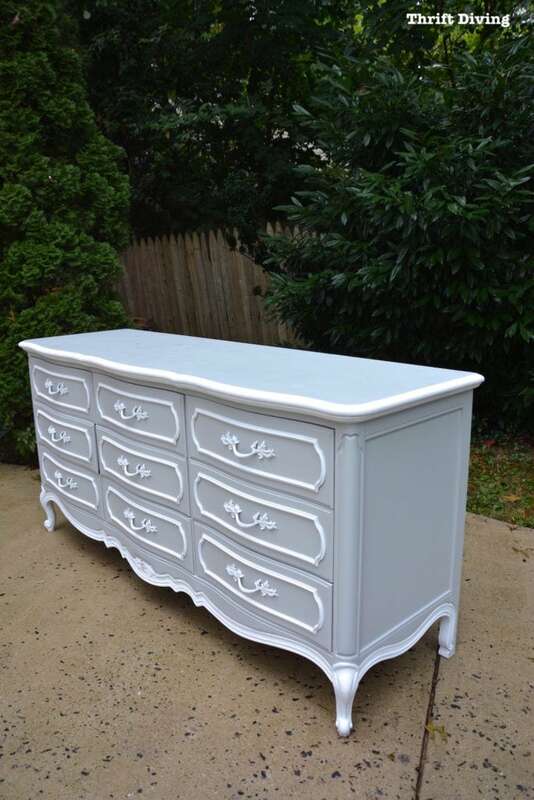 So what do you guys think of this awesome DIY dresser makeover on this French Provincial dresser? 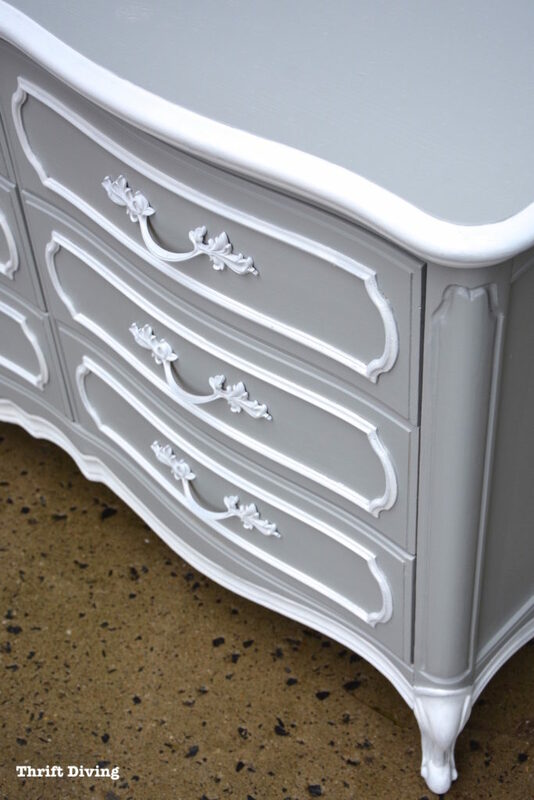 I’m always amazed at how a lick of paint can transform tired old furniture and turn it into something special. 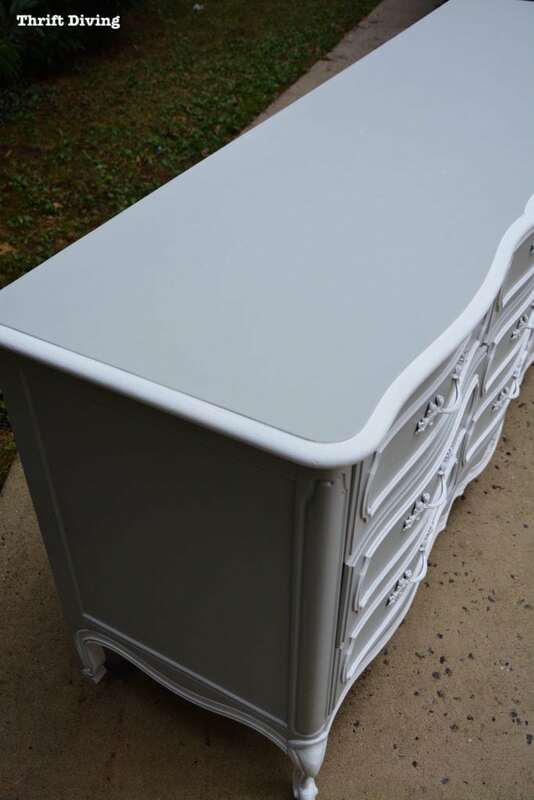 This dresser turned out fantastic. I love the colours you chose too, in fact, I transformed my bedroom furniture with these colours too and they have a similar look. I’ll definitely be pinning this and I’m so glad I found you through the Style Showcase this week! Your dresser came out lovely. 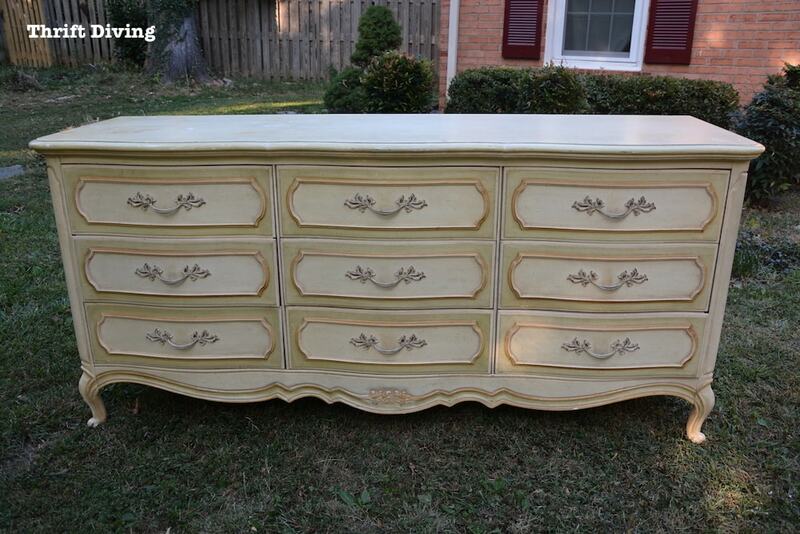 I have the same dresser, but my price was better. Picked it up on the side of the road and with matching mirror. FREE! Set is so well made it’s unbelievable! 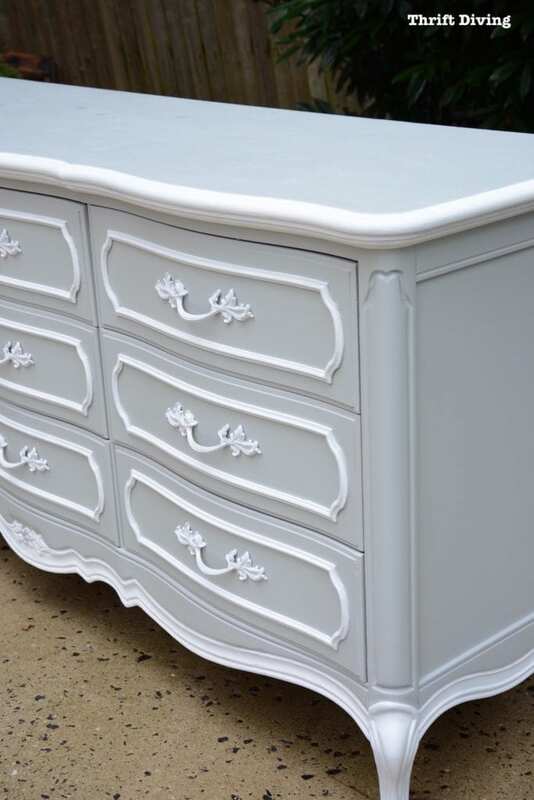 I am going to look into this product for redoing my cherry dresser and chest in my master bedroom. So hesitant about taking a paint brush to it.